If you could eat science and technology, fall at McGill would be one big free lunch. Here are some upcoming events on and off campus. Check out the Tribune website for more SciTech events throughout the year! This wildly popular lunchtime lecture series brings students and professors together to discuss research. Each professor is given five minutes to present their research, then presenters and students discuss the research over free soup and sandwiches. This fall’s lectures will cover topics that range from ‘weakly electric fish’ to earthquake physics. It’s a great opportunity to get hired for lab work, to get inspired by cutting edge research, or simply to eat free food. Be sure to get there early as it fills up quickly. If you miss this session, there’s another in the winter. September 10-14th at 11:30 a.m.
At Freaky Fridays, informal lectures are paired with popular movies. Examples of past ‘freakies’ include Climate Science and Geology — A Tale of Three Histories and The Day After Tomorrow, as well as Oxytocin Me Baby —The Truth About the So-Called Love Hormone and The Notebook. Get a beer at Gerts afterwards, and you’ve got yourself an awesome casual date. The first Freaky Friday will be Monster Ants and Genetic Engineering and Super 8 on October 26th. Friday afternoons at 5 p.m.
Watch documentaries from NOVA, CBC, Science, Disneynature and similar networks on the big screen in the museum. This could make a nice study break come midterm season, or a decent hangover cure. This weekend’s documentary is Amazing Journeys, the story of six migrating species. The Redpath Museum holds inexpensive or free events throughout the year including late night flashlight tours on Nuit Blanche. Upcoming free events include a presentation on First Nation culture (September 30th from 1-3 p.m.) and the Women in Science, Engineering, and Medicine Symposium (October 13th from 1:30-7 p.m.). Dinosaur bones, mummies, and a geological garden can also be seen by daylight, during the museum’s regular hours. For more information visit the Redpath Museum website (www.mcgill.ca/redpath/). McGill researchers lecture on their latest findings for the general public. The first lecture of the fall, In Search of the Source of Earthquakes, includes a chance to look at rocks formed during earthquakes. September 13th at 6 p.m.
SSMU is inviting you to hack the city of Montreal—for the greater good. Help write programs to improve various aspects of Montreal—transportation, urban planning, agriculture, sustainable development, land use, housing, parks, public spaces, and more. New hackers can take workshops to improve their skills. Cheap food and coffee will be on hand for hackers of every skill level. September 8th from 9 a.m.-5 p.m.
During this two-day conference, speakers and participants from over 25 countries will deliver concrete ideas to improve global food security. Students can attend this high-level, international event for less than 15 per cent of the normal registration fee. Those who can’t make the conference can always attend the public lecture that kicks it off. October 16th at 5 p.m. The McGill Office of Sustainability is holding a fair that will answer questions like: where can I recycle my old electronics, how do I get money for a sustainable project, and what are those green lumps on McTavish Street. The question they’ll answer best: how can I get involved with making McGill more sustainable? This fall lecture series focuses on international research; many lectures will discuss health issues in developing countries. The first lecture starts close to home with Why Canada Could Be the Next Bioenergy Powerhouse. However, the international way in which biofuel technology is being developed upholds the theme of the series. Lectures run bi-monthly from September to November. September 11th – November 20th from 7-8:30 p.m.
Darwin’s Mad Dream: What Error and Invention Tell Us About How Science Works is one upcoming public lecture at Concordia. October 11th at 8 p.m. 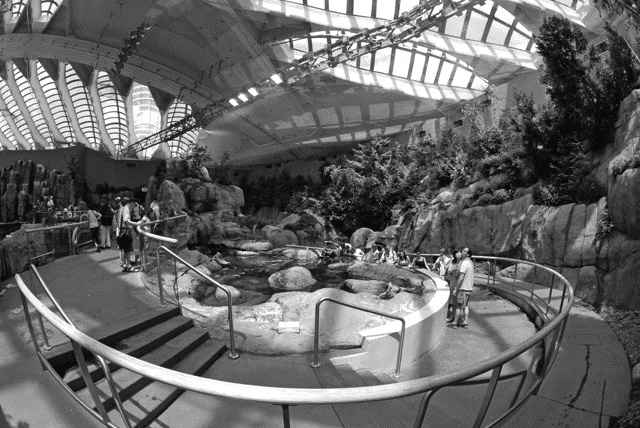 The Biodome is celebrating its 20th birthday with free admission for anyone born in 1992. The Montreal Science Center is turning 10 this year. Although the center is designed for a younger crowd, cool and interactive exhibits never get old. Thursday – Saturday from 10 a.m. – 9 p.m. and Sunday – Wednedsay from 10 a.m. – 6 p.m.
A lecture series put on by McGill in November. A lecture series and video game development conference that will end in a massive gaming event in February. For more information, please visit our calendar of events at http://mcgilltribune.com/?page_id=14634.